When I turned 50 years, my stamina to play competitive chess started to go downhill. At one point in the chess club after a team match I rather loudly lamented that I could not play for five straight hours at full force anymore. After 3-4 hours of play, I would want a nap. Or drink enough coffee to keep me awake for a week. Or just go zombie and stare clueless at the same position for 20 minutes or more. Jacob Aagaard, a club mate at the time, then suggested that I should sharpen my game. Force a culmination, a decision, early in the game, to avoid long games. That could be the remedy for me. It sounded attractive at the time. So I pondered it seriously. Hmmm, playing the Albins Countergambit instead of my boring Slavs and Caro-Kanns!? Why not! But one does not just change styles like that. Trying to change style is not an easy matter. Trying to sharpen the game requires time, too! I would often use a ridiculous amount of time in doing so, ending up in time pressure and fatigue anyway. In fact, Aagaard could just as well have suggested that I should stop smoking. Or take up regular gym and lose 15 kilos. Both would have had a clearly positive effect on my chess. Fitness and improved rating sound like a good combination. Was it not Botwinnik the iron man who regularly took long walks over the steppes before an important game! Alas, that fitness trip never quite materialized, either. And who wants to give up smoking just to improve one’s chess game, I ask? So I have continued to be on the lookout for some other means, some magic formula to improve my chess and stamina. And then one day I found it! The chess bookstore had a book named “Intuition in chess”. With joy in my heart I could read on the back cover that “Players who try to calculate everything to a finish will often lose themselves in a maze of variations, while those who use intuition to the full will save both time and energy…”. The right remedy indeed. Lucky me! I bought the book and began a serious study of this intuition phenomenon. It turned out that intuition was especially recommended by players like Smyslov. And that mostly in his later years. So where Kortchnoi will calculate variations concretely, Smyslov would put on the auto pilot. On the other hand, the real master of intuition turned out to be Michael Tal. Sharp, dubious sacrifices were his brand, often played without calculating concrete variations, but instead played by instinct. Yes, by intuition! And he did it with great success. To defend against Tal is no easy matter. So I trotted through the book. It has many interesting examples, and many original combinations. Lots of food for thought on middle game positions and how to sharpen the struggle, often through risky play. But was it intuition, or what? I started to have my doubts. One example in the book which comes to mind is the famous (infamous!) game by Bent Larsen, a black Nimzo Indian against Taimanov. Larsen played the entirely surprising and greatly weakening move …g7-g5 from nowhere. Risky and unbalancing play in order to confuse the opponent. As the game went, Larsen succeeded. But stop a while – this is NOT intuition. Larsen realizes that he will go downhill and be left with an inferior position if the game continues along normal lines. So he deliberately unbalances the position and takes his chances in a wild melee. White should have played 16.Ne5, and after a continuation like 16…d4 17.Nxc6 bxc6 18.exd4 he could have enjoyed the weakness in the black position. By then I realize that the title of this book is misleading. That intuition is not a phenomenon or a chess element which one can directly isolate and apply. It is more complicated than that. That does not mean that the book itself is bad. It is more a sort of publishing oversell. As in a “Play with intuition and win” sort of advertisement. Which always turns out to be an empty promise. Like most opening books. Or a new slimming recipe. They promise a lot, but improvement does not appear, instead grim ordinary life just goes on. So the term “intuition” was not the magical remedy or concept to solve my stamina problem. It is not an element or technique which can be used as such. Maybe it is just like a term like overprotection, which is one of the elements of Nimzowitsch’s System (which is not a system, by the way). Nimzowitsch had his bag of tricks, and overprotection was one such. But that does not mean that he methodically sought to overprotect in his games. Or that he always pushed his pawn to e5 against the French Defense. We might as well replace the term intuition with everyday expressions like “feeling”, or “experience”. Or, as Anand is expressing it: “Intuition is the first move I see in the position”. Exactly. It has something to do with spontanious reflexes. Or, in other words, the way we play when we play blitz games (especially 1 minute games). But is that what is ultimately the essence of intuition? Are we talking blitz games here? I think that the truth is that there is no shortcut to improving ones chess. It is, as we have known all along, a question of hard work and a devoted attitude. But then what about the natural ease by which Tal won his sharp and intuitive games? What was his secret? At this stage I am reminded by the painful memory of the tenth and final game in the semifinal match between Tal and Larsen in 1965. Painful, because Tal won that game, and the match 5.5 points to 4.5 points, while I had been cheering for Larsen, my tribesman and hero. Tal has just played Bf1-d3, to which Larsen replied b5-b4. The game continued with 16.Nd5! ?, a chancy and risky piece sacrifice. The game went on and Tal won in his usual murky and street fighting manner. Note that Tal’s sacrifice is not intuition. It was prepared already by the move before, 13.Bd3. Likewise, Larsen could not have been surprised by the sacrifice. His ...b5-b4 almost forces it. Invites it! No wonder why I (intuitively) recalls this game, because Pachman uses the very term himself! But this nevertheless does not overturn the arguments I have already tabled. And the explanation for Tal’s apparent buccaneering playing style, and his unclear sacrifice in the Entscheidungspartie against Larsen, is to be found a completely different place. Tal is born and grew up in the town of Riga, the capital of Latvia. Here, the chess rules have always been a bit different from the rest of the continent. One main difference is that the knights, just like the pawns, can only go forwards, not go back. Throughout his upbringing, Tal has been playing with this rule. And it has been so embedded in his subconscious, that he often forgot that in play and tournaments outside of his native resort, knights were also allowed to move backwards. Occasionally, this even influenced his play in world championship matches. And that is real and obvious explanation for Tal’s dubious and risky sacrifices, including his move 16.Nd5 against Larsen. The knight has to move, and can only move forward! Tal, a world champion at one point, understandably was embarrassed by these occasional slips, and he never admitted his handicap to any outsider. Since his moves often won anyway, the secret was kept until now. But I can hereby disclose the truth. It has been told to me by Alexei Shirov, with whom I shared a keg of wine in Seville lately. 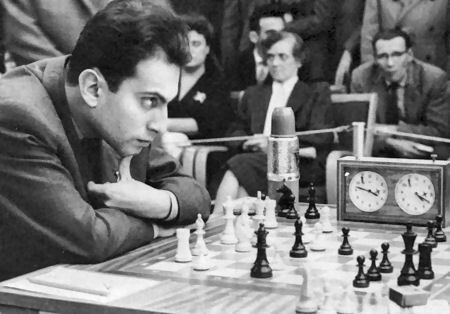 Late in the night he narrated how he used to play and analyze with Tal and enjoy and admire the wild and risky playing style. 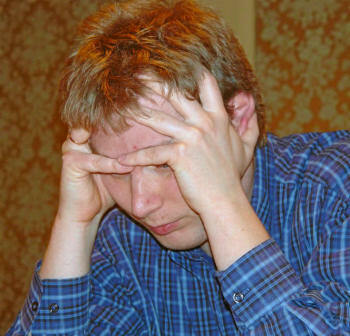 As we all know, Shirov is also from Latvia, and was also brought up with the rule about the knights only moving forward. So Tal and Shirov would often play and analyze with their “intuitive” rules for the knights. Many of their opening preparations were also based upon this flawed childhood rule. Black has put all his men in good positions. The comments from the press room at the time indicated that Shirov could now play 20...Qc7 21.Bxd4 Nd7 and put the knight on the square e5, with dominant effect. It is only now that we realize that such a maneuver would never be allowed to surface in Shirov’s natural subconscious intuition of knights-can-only-move-forward-never-backward. Now you know the truth behind the “intuitive” sacrifices of Tal and Shirov. Niels Lauritsen, 60, is a Dane who currently works for the Red Cross in Uganda. During an earlier posting there he won the national chess championship 1993-1995 three years running. He also writes a weekly chess column in the New Vision newspaper. 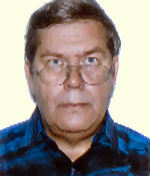 He is a senior international master in correspondence chess. When not somewhere in Africa, he plays in the OBRO chess club in Copenhagen.